The original Torque Converters, Inc. turns cutting edge technology into a race winning tradition. 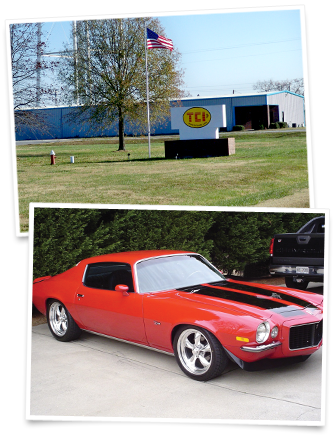 When TCI® first opened its doors in 1968, it was a modest operation dedicated to delivering high performance transmission-related parts to a small group of devout drag racing enthusiasts. From those humble beginnings in Memphis, TN, TCI® has grown to be one of the largest and most technologically advanced manufacturers of high performance aftermarket drivetrain products in the world. Currently located in two large facilities in Ashland, MS, some 45 miles from parent company the COMP Performance Group™, TCI® continues to set trends and expand its line of quality transmission torque converter and accessory parts. The original directive, to deliver high performance racing torque converters, is still a core business for TCI®. However, the need for high performance street products, including high-quality automatic transmissions, has increased dramatically, led by an eager contingent of enthusiasts who enjoy improving the performance of their street driven vehicles. Because of these changing trends, TCI® business has changed considerably with 80 percent of their products targeted to street enthusiasts and 20 percent to hard-core drag and circle track racers. The growth of TCI® over the years has been impressive. Based in Memphis for its first 14 years, the company eventually relocated to Ashland, where it still is today. Through the years, expansion of the product line evolved through careful and calculated observation of the trends within the performance industry. After several subsequent ownership changes, in 1995 the company was purchased by Fel-Pro Corporation based out of Chicago. The move relaunched the company and brought about significant improvements, including a dramatic expansion of the TCI® facilities to 120,000 square feet and stimulated new product creation. In 1998, Federal Mogul purchased TCI®, followed three years later by the Memphis-based COMP Performance Group™. TCI® continues to grow by adding complementary drivetrain performance products, such as automatic transmission shifters, transmission oil coolers and fluids, driveshaft components and complete transmission packages for almost every domestic built application. Each product is tested in the on-site TCI® R&D lab, which includes a full durability test dyno where transmission components can be tested during development to help in their design and execution. Employees of the company clearly enjoy their work. Most of the current management team has been in position for twenty years or more, which also helps to maintain consistency in the quality of the product and a firm, first-hand grip on what it takes to hit their target audience. 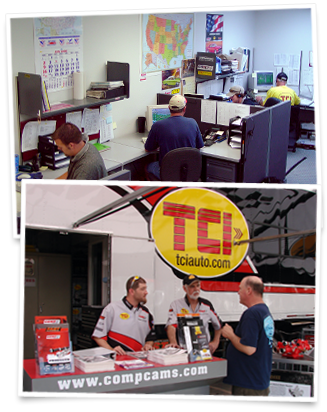 In addition, many of the TCI® employees are enthusiasts themselves, taking their professional interests home to build personal performance vehicles or create full-on racecars which they drive at the many local racetracks. Throughout its history, TCI® has looked to not only create outstanding products that deliver superior performance to its customers but solve common problems in the field. They can now do this better than ever with one of the largest engineering teams in the aftermarket at their disposal – nearly two dozen engineers make up the COMP Performance Group™ engineering staff that includes TCI® drivetrain specialists. Well known for high-quality parts constructed from the best materials, TCI® has implemented strict quality control procedures. The legendary TCI® Triple Test procedures are conducted on each transmission and torque converter that is shipped from its facility. Step one of the transmission checks is a thorough computerized testing of the valve body to ensure proper shifting and correct alignment and positioning of internal components. Next is a full assessment of the internal hydraulics to ensure the highly complex systems inherent to the transmission are operating correctly. 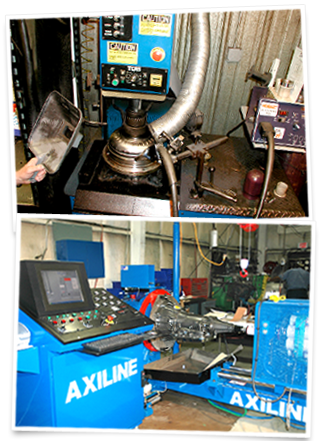 The final test is the elaborate Axiline dyno test, which individually tests each completed transmission by running it through each automatic gear selection and testing for proper shifting sequences and features. The Axiline dyno also prints out a full assessment of the transmission’s operation; a document which accompanies each new transmission when shipped to the customer. All TCI® torque converters are also triple-checked and run through a similar set of procedures specifically designed by the TCI® engineers to ensure top quality. A long way from their start back in 1968, TCI® and its employees have formed a bond with their customers through the creation and delivery of highly reliable and top-performing transmission and accessory parts. Led by their team of well-seasoned management, excellent market knowledge and dedicated employees, TCI® is the engineer of superior drivetrain solutions. Choosing the perfect drivetrain products for your application isn’t a simple process. Every part of your drivetrain is a critical piece of a complex, interlocking system that needs to match perfectly in order for your application to generate peak performance. That’s why we provide expert technical assistance to our customers – free of charge – through our toll free tech help lines and our online tech support system. Our staff of highly trained, expert technical advisers, backed by a vast inventory of precision-manufactured drivetrain components, makes sure that our customers have the proper parts for their specific applications the first time. Customer satisfaction is not only gauged by dyno performance numbers but by repeated customer loyalty built through years of personal, one-on-one contact. From the initial concept to the finished piece, every product that we make undergoes exhaustive quality control testing to ensure that it will put the power to the pavement without failure - every time. Our fully furnished Research & Development and Engineering facilities contain state-of-the-art equipment staffed by passionate and highly trained employees. With dedicated test vehicles, specialized measuring equipment, multiple dynos and cutting edge design software, TCI® is able to produce innovative drivetrain products that set the industry standard for performance and reliability.